RMSA (Rashtriya Madhyamik Siksha Abhiijan) was invited the candidates for the exam of Assam Madrassa TET (Teacher Eligibility Test) 2014-15. RMSA Assam TET exam will held on 3rd,4th and 5th January 2015. Candidates who have been filled their online application form of RMSA Assam Madrassa TET 2014,now eagerly waiting for their Assam TET admit card 2015. Candidates can download their RMSA Madrassa TET admit card 2015 from official website of RMSA Assam. Official website of RMSA Assam is www.rmsaassam.in. Candidates visit this website,here admit card will published before exam date. Candidates can download their Assam TET Madrassa exam admit card 2014-15 by the help of their registration no and date of birth. RMSA Madrassa TET exam will complete in two shift,morning shift will start from 9:30 am to 11:30 am and afternoon shift from 01:00 pm to 03:00 pm. On 3rd January 2015 (03-01-2015) Lecturer and M.M Assistant Teacher and Assistant Teacher, B.A and Assistant Teacher, B.Sc post exam will held. 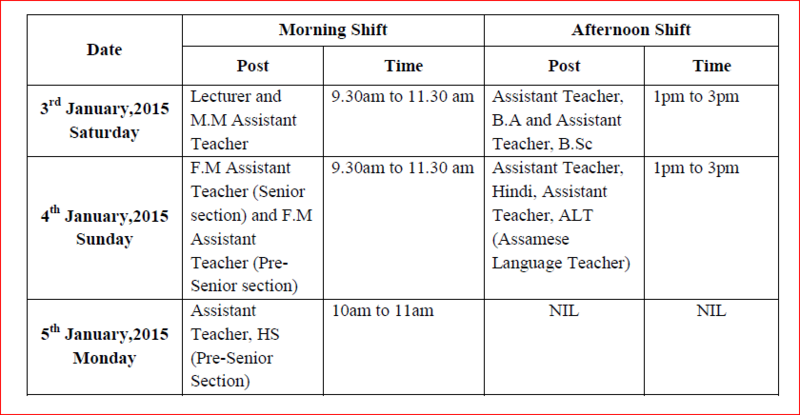 On 4th january 2015 (04-01-2015) F.M Assistant Teacher (Senior section) and F.M Assistant Teacher (Pre-Senior section) and Assistant Teacher, Hindi, Assistant Teacher, ALT (Assamese Language Teacher) post exam will held and on last date of exam Assistant Teacher, HS (Pre-Senior Section) post exam will held. Candidates can download this image for complete details. RMSA official website is going to published Assam Madrassa TET admit card 2015. Candidates kindly wait 1-2 days more admit card will available soon on www.rmsaassam.in. Candidates who want to get latest update about RMSA Assam TET admit card 2015,can lie this website on Facebook. Lovelyheart team will update admit card link on Facebook fan page. We will also update Assam TET answer key and Assam Madrassa TET result 2015 after completing the exam on Facebook page. You can also leave your registration no and date of birth in comment box. Direct link of Assam Madrassa TET Admit Card 2015 is given below. Candidates click on this link and fill their application no and date of birth. Download your Madrassa TET hall ticket and keep safe it for enter in exam hall.